Our Wedding Day Remembered. Under Our Tree. I already shared our "banana-shaped" tree topper - which I love - along with my little monkeys. But, my favorite part of our tree is our tree skirt. When Jason and I were planning our Christmas-themed wedding, I wanted to have as many Christmas-y details as possible - without it looking like Santa and his elves set up shop at the church or reception. I wanted our guestbook to be unique - and I wanted it to be Christmas-themed. So, I asked my adopted "Mom", Mercy, who is the best seamstress I know, if she would make one for me. But, not a book. Mercy picked out the gorgeous red fabric and made an exquisite skirt. And, as our guests arrived to the church for our wedding, they signed our "guest book" with permanent gold and silver metallic pens. 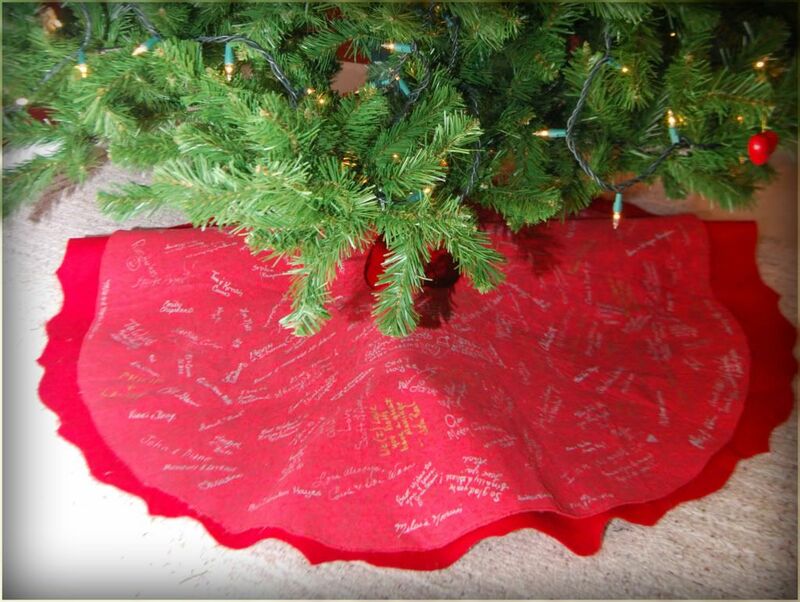 Every year, as we pull out our tree skirt, Jason and I sit down and look at all the names. We tell stories of our memories of different friends and family, and laugh at some of the silly notes they wrote to us. And, we relive - all over again - that magical day. this is wonderful. how i wish i would have thought of that idea for our Christmas wedding. i can only imagine the laughs, the memories, and the joy. What a great idea! I had a great time clicking over and reading about your Christmas wedding. It looks beautiful! Saw some familiar faces in there too!! Sarah! That is a brilliant idea. What a wonderful way to remember those who came to your wedding and a marvelous keepsake. You are so clever!! I love that idea. 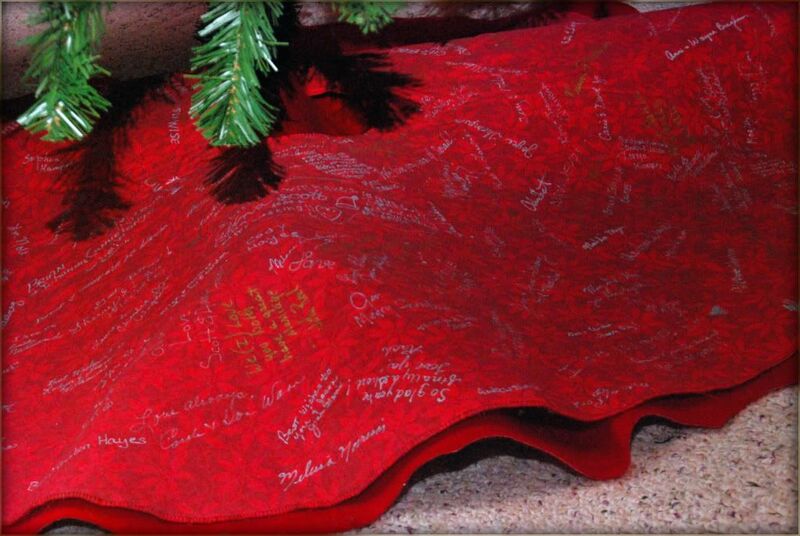 Do you think we could invite everyone over from our day 12 years ago to sign a tree skirt for us??? I'll have to remember that for our kids. We were just at a wedding recently, where we signed the mat around the couples engagement photo. I thought that was a fun idea too! What a wonderful way to remember your special day! Thanks for sharing! wonderful, creative, and a keeper! it is so outside the box, and will not be tucked away in a box, never used. btw-i have made 3 of your cookie recipes! i am hiding from the kids and eating a caramel meltaway as i type. so easy, so yummy! i will blog about it and link you later. I love how you write your stories, because even though I have already heard some of them, you write it in a way that makes it seem as if I'd never heard it before. Love this idea and it turned out beautifully! What a cherished remembrance of what I'm sure was a magical day! This is such an original idea and I love it! How precious to have that for all your future years together!! 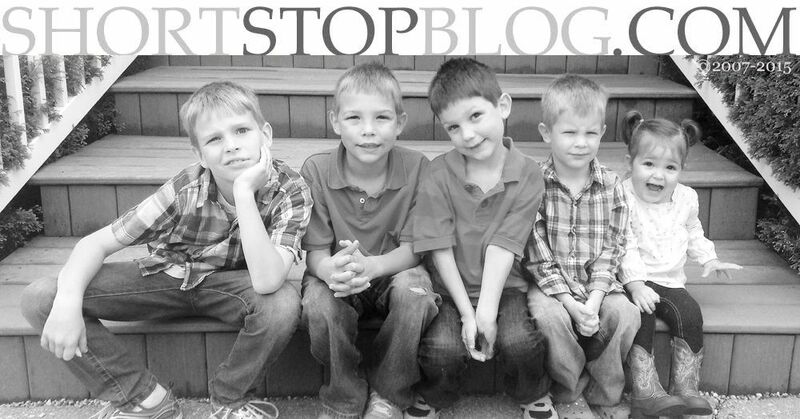 What a great idea- and a wonderful way to relive these special memories each year! AWWWW! I totally forgot that I made that for you! I ALWAYS remember your wedding day... every day, when I look at the photo of John and I at the church, and the one of you and me at the reception that John took. Remember? You framed and gave it to me. That was the most beautiful day, and the most beautiful wedding for a wonderful little girl. That's the best idea I've seen all day! What wonderful way to remember that special day! What an absolutely brilliant idea. How wonderful that you get to see the names of those who shared your special day each Christmas. I love it!!! how beautiful and so very special. it's nice that you get to see it each and every year. 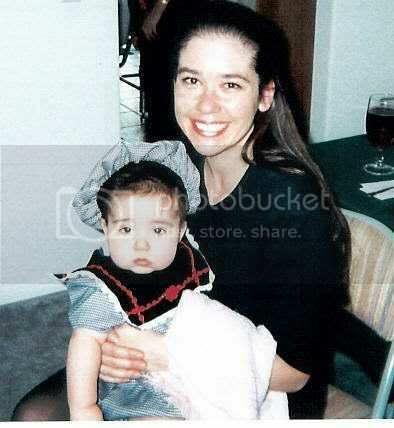 Okay as soon as I think I can't get teary eyed, I do--this is absolutely precious!!! I so love your tree topper on the other link. lol at Johanna's comment. I remember this at your wedding, and I am 99% sure that I signed it. It really was a beautiful day. I love that you still use this as your tree skirt! What a fabulous idea. It turned out so pretty. Ah! What a great idea. What sweet memories that must inspire every year. NOW that was a great idea!!!!! wonderful!! That is just the best idea, to remember your guest at your wedding! Fabulous idea. I am with Kristen...wish I would have thought of that for our Christmas wedding! What a fantastic idea Sarah and what a wonderful memory every year. How creative of you both to think of doing that. Happy anniversary to you and what a crowning blessing to have your 4 boys.